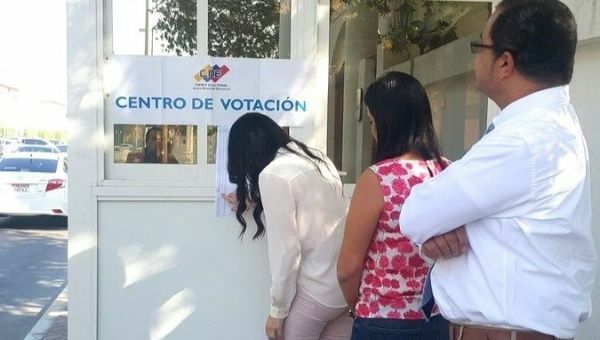 Venezuelan embassies around the world announced the opening of polls with photos of voters participating in the 2019-2025 elections. May 19 (teleSUR) Venezuelans are arriving at polling stations around the world, beginning with Australia, China, India and Malaysia, Foreign Minister Jorge Arreaza announced late Saturday, to cast their votes in the May 20 presidential elections. “#20M’s Venezuelan electoral process starts. Australia, China, India, Malaysia have already begun to receive Venezuelans to legitimately exercise their right to vote,” Arreaza posted on his official Twitter account. The minister’s message comes just hours after tweets began emerging from embassies with pictures of voters participating in the 2019-2025 presidential elections. Immigrants in Beijing and Hong Kong were among the first to cast their ballots. Russian Federation is ready for the electoral process in Moscow, where 270 people are registered to vote. Charge d’Affaires Daniel Gasparri is the first Venezuelan to exercise the vote abroad, in Australia. Open voting process in Beijing, People’s Republic of China. Ambassador Augusto Montiel exercises his right to vote in New Delhi. Start of the electoral process in Vietnam. Venezuelan citizens in Belarus turn out to exercise their right to vote. In Venezuela itself, polling stations open at 6:00 am local time and millions are expected to turn out to vote. The electorate traditionally celebrates the elections with festivals, dancing and music. Venezuelans consider their right to vote an honor and a privilege, and the state supports these sentiments by scheduling elections on a Sunday, a day generally observed as one of rest and spent with family and friends. Ceela member Guillermo Reyes said the delegation participated – along with a representative of all parties involved – in 14 audits of the digital electoral system. All audits have been streamed live through the National Electoral Council’s website. International observers welcomed Maduro’s announcement.